Hard to compete with Alex, this guys is a factory of great graphics. Alex drips pak192.comic graphics like most of us drip sweat. To spare the inhabitants of Oremine Hill with the noise and view of the nearby oremine, they planted a forest barrier. With time, more and more pathwalks through the forest emerged, until it was declared the "Oremine Park" by the city counsil and restructured. Finally, a not very smart businessman buildt the green skyscraper, which has a 'really nice' view over the deserted land around the ore mine. Wow. Those buildings are stunning! Pak128 has dominated the contests for awhile, but it seems those days are permanently over. I shall see if I have time and ideas to try and match those screenshots now that the bar has been set this high. I feel pak128 should defend itself although I wouldn't mind in the slightest if the pakset behind those pictures became the new face of simutrans. I think Pak128 suffers from its inconsistent graphics, there are too different graphic styles in it. With the current weather in the Netherlands this goes very fast! There is enough graphics in pak128 to make 3 different paksets... it does indeed suffer from a lot of styles, added to over the many years. It does give a lot of nice options for building a screenshot for the contests, however. pak192.comic's beautiful simplicity in its style makes it very visually appealing. Maybe the city generation should make automatically separate neighbourhoods or city districts with different building styles. I agree that the auto-generated pak128 cities are like it's forests, "fruit salad" style. You know, there was a party going on for a few days in the pak192.comic developer chat because of the awesome feedback clearly, we are on the right way visually. Clustering might help. The "districts" would only be one block of houses, but it could still be an improvement. Additionally, I think it's fair to assume that a neighbourhood/city district code would be based on how the clustering works, just with a bigger distance and amount of buildings to check, so replacing "cluster=X" with "neighbourhood=X" at a later time should be possible with a textcrawler. Very good idea indeed. I thought of it with cities (having a city building only houses of the same style) too. Not the biggest but the most beautiful Central Park - here in Simuthania Downtown. 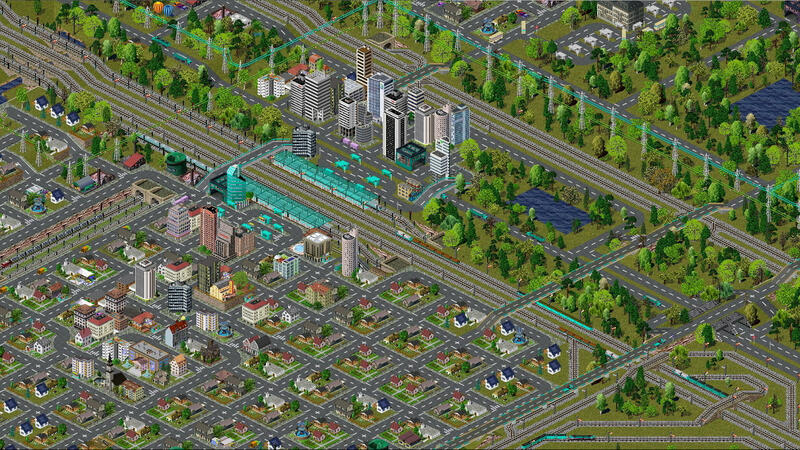 Derivated from a multiplayer online game, the cities of Renlock and Appingcross, decided to open a large park with trees and lakes, in the middle of the highways and railways that cross this part of country. Park in the upper left, is exhibiting a vehicle that my company used in the past. Park in the lower right, is nearby a few stops from the city center, green space for relaxation and refreshment of the citizens. This is a much sought after park in my city, it is the only one that has native trees for your area. It's in the west of Burgos (in the North of Spain), at the riverside. Its name (Island Park or Promenade) comes from a real island formed by the Arlanzón river and a mill canal. Its construction began during the French domain. It has different kinds of gardens and plants (it's a botanic garden), some of them are from other continents. Also, it has many monuments, such as several fountains (one from a monastery), a pond with the province shape, two baptismal fonts, a romanesque arch and a bust of Miguel de Cervantes. This promenade finishes at Malatos bridge, a part of the Way of Saint James. At the other riverside is the Military Hospital. At these screenshot (at the fifties) I tried to play this park, including the bridge. The buses have the livery of Burgos urban service bus (one line in each riverside). Also, we can see a Citröen post van. For this created scenario (not real game), I used pak 128 with Spanish Addons. You can get these and these Addons at The Simutrans Boxroom. I'm not really sure what constitutes a real game. I place tracks and run a service and maintain stations/depots/signals but use the public player to place cities where needed, place buildings where I want a different district etc and to make things look good. I didn't just make this park for the competition. The termini for the capital city makes the usage of cross town transport essential. 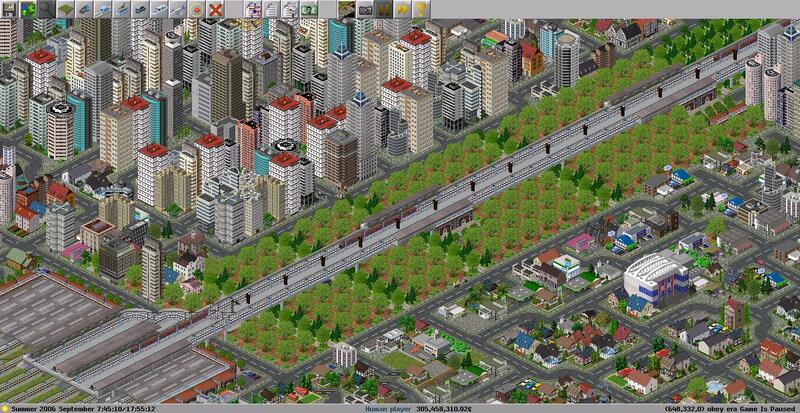 Initially a tram way was considered with two strips of park flanking to create a much needed green space. Eventually the decision was build the new north/south link as a suspended railway over the new city park, to provide a pleasant gateway to the still growing financial district for foreign investors to be welcomed by.